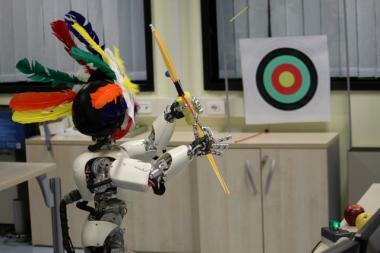 The humanoid robot iCub has learned a new skill: archery. After being taught how to hold a bow and shoot an arrow, it learned for itself how to improve its aim, and was so successful it could hit a bullseye after only eight trials. The algorithm used to teach iCub, developed by Dr. Petar Kormushev and colleagues of the Italian Institute of Technology, is called the Augmented Reward Chained Regression (ARCHER), a chained vector regression algorithm that uses experience gained from each trial to fine-tune the next attempt by modulating and coordinating the movements of the robot’s hands. Movements of the arms are controlled by an inverse kinematics controller. After each shot a camera takes a picture of the target and an image recognition system based on Gaussian Mixture Models determines where the tip of the arrow hit the target by filtering the colored pixels of the picture based on their likelihood of belonging to the target or the arrow head. This information is then used as feedback for the algorithm.